A SpaceX Falcon 9 rocket arrived at launch pad 39A on Florida’s Space Coast on Sunday, a day before liftoff with a powerhouse Inmarsat communications satellite designed to spread broadband beams connecting airline passengers, maritime crews and U.S. and international military units with Internet and data services. 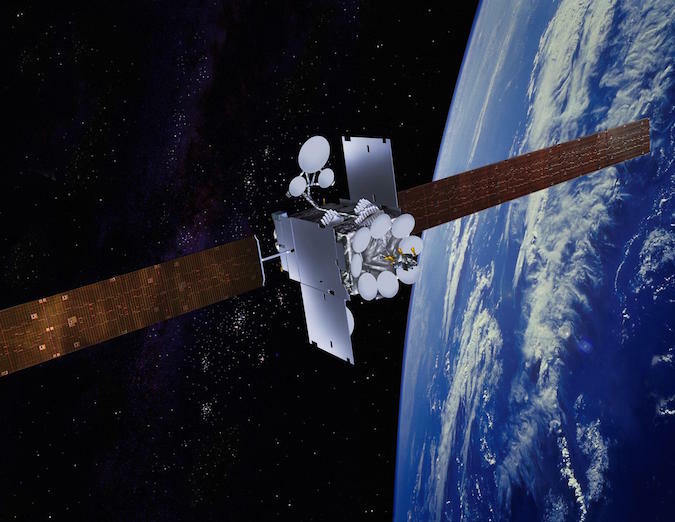 The new satellite will join the $1.6 billion Global Xpress broadband network developed by Inmarsat, a London-based company originally established to provide emergency communications to ships at sea that is now expanding its service into the airborne connectivity market. Three Global Xpress satellites are already in orbit providing global broadband for mobile customers, and the fourth one set for launch by SpaceX on Monday is the next step in expanding the service. “We’ve always said that Global Xpress, with the first three Inmarsat 5 satellites, provides global coverage, but it’s a relatively thin layer, and then we would start going deep where needed, as needed, as market requirements push forward or user patterns change,” Franci said in an interview with Spaceflight Now. 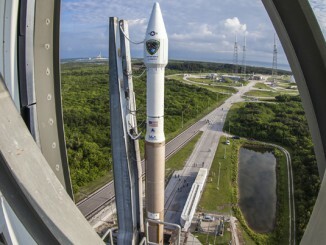 “This satellite we’re launching Monday will start providing some of that. 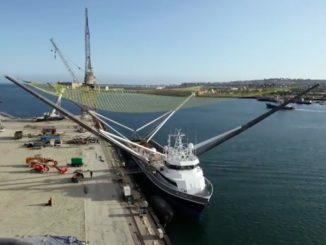 “It’s not designed as a local augmentation, but it nevertheless does bring significant additional capacity, and thanks to the fact that we have steerable beams on it, we can create this effect of concentrating capacity in particular areas of the world where needed,” Franci said. 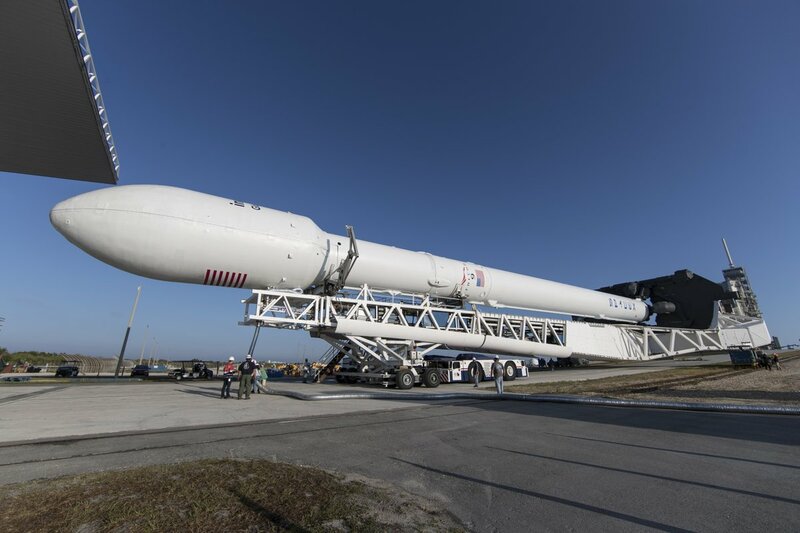 The Boeing-made Inmarsat 5 F4 communications craft, valued by itself at up to $250 million, will launch from NASA’s Kennedy Space Center aboard a 229-foot-tall (70-meter) Falcon 9 booster at 2321 GMT (7:21 p.m. EDT) Monday, the opening of a 49-minute launch window. Forecasters from the U.S. Air Force’s 45th Weather Squadron predict an 80 percent chance of favorable conditions at launch time, with the only concerns being cumulus clouds near the Atlantic coastline and anvil clouds blowing toward the spaceport from inland storms. SpaceX ground crews transferred the fully-assembled rocket from a hangar at the southern perimeter of pad 39A up the incline to the historic launch complex Sunday. Engineers from Boeing’s satellite control center in El Segundo, California, planned to finalize checks on the Inmarsat satellite Sunday night and verify the spacecraft’s readiness for launch. Technicians were expected to hoist the two-stage rocket vertical at pad 39A with hydraulic lifts overnight, with final countdown preparations on tap Monday morning. SpaceX’s launch conductor will poll the launch team at 2208 GMT (6:08 p.m. EDT) for a “go” to begin loading super-chilled, densified propellant into the Falcon 9 rocket. RP-1 kerosene should be pumped into the Falcon 9 beginning at 2211 GMT (6:11 p.m. EDT), followed by cryogenic liquid oxygen at 2236 GMT (6:36 p.m. EDT). The propellants will continue flowing into the rocket until the final few minutes of the countdown, when the Falcon 9 will switch to internal battery power and its tanks will be pressurized for liftoff. The Falcon 9’s computers will command nine Merlin 1D engines to ignite at the base of the rocket at T-minus 3 seconds. Following an automated health check, the launcher will climb away from pad 39A with 1.7 million pounds of thrust, veering to the east over the Atlantic Ocean. Monday’s mission will loft one of the heftiest payloads ever launched by SpaceX, and the heaviest sent by a Falcon 9 into geostationary transfer orbit, the target orbit used by most telecom satellites. With a launch mass of 13,417 pounds (6,086 kilograms), Inmarsat 5 F4 will take all of the Falcon 9’s power to soar into as high of an orbit as possible Monday, according to Franci. SpaceX typically attempts to land the Falcon 9’s first stage at a recovery facility at Cape Canaveral or on an ocean-going barge offshore, depending on each mission’s requirements. For Monday’s launch, neither landing target is achievable. Instead, the first stage will drop into the Atlantic Ocean like other rocket boosters. 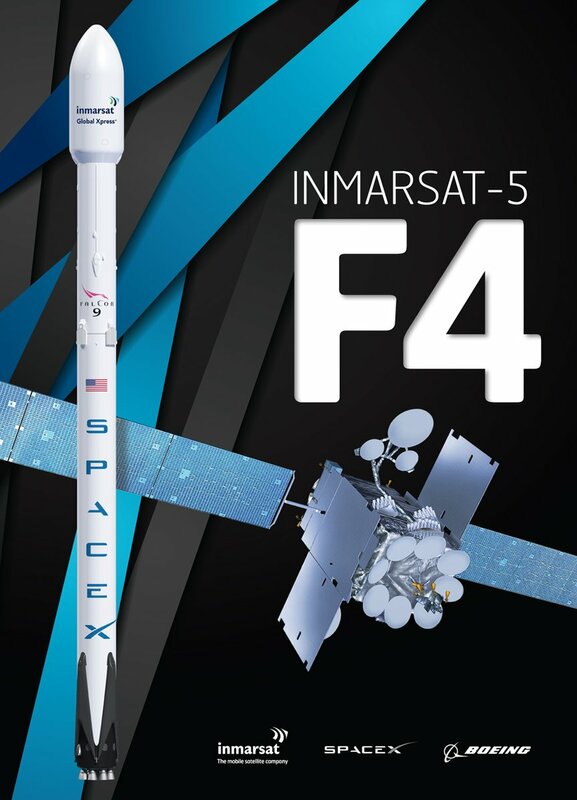 SpaceX has heavier satellites on its manifest in the coming months, but Inmarsat 5 F4 is the biggest test of the Falcon 9’s lifting capability to date. “These records are meant to be beaten anyway,” Franci said. The Falcon 9’s first stage engines will fire until T+plus 2 minutes, 45 seconds, and then the 14-story booster will fall away from the rocket’s upper stage around four seconds later. A single Merlin 1D engine, fitted with an enlarged nozzle for better efficiency in the airless vacuum of space, will start up at T+plus 2 minutes, 56 seconds, delivering 210,000 pounds of thrust for nearly six minutes to steer into a preliminary orbit. The rocket’s nose cone, a composite fairing that shields the satellite during the first few phase of flight, will drop away from the Falcon 9 during the second stage burn at T+plus 3 minutes, 35 seconds. After shutdown of the second stage engine, the rocket and the attached Inmarsat 5 F4 satellite will speed across the Atlantic Ocean, flying over Cape Verde before firing its engine again near the equator at T+plus 26 minutes, 59 seconds. Franci said the 56-second engine firing is designed to push the telecom payload into a “supersynchronous” transfer orbit, with an apogee, or high point, above the satellite’s 22,300-mile-high (35,800-kilometer) final operating position. Parameters for the target orbit are not available, he said, because the upper stage engine is programmed to keep firing until it is almost out of fuel, a technique rocket engineers call a “minimum residual shutdown.” The tank-draining burn is intended to ensure the Inmarsat 5 F4 satellite goes into as high of an orbit as possible, reducing the work the craft’s own thrusters need to do in the coming months. Deployment of the satellite from the Falcon 9’s upper stage is scheduled for T+plus 31 minutes, 48 seconds. Around a half-dozen orbit-adjustment firings by the satellite’s hydrazine-fueled thruster are planned in the first couple of weeks after launch, followed by the extension of Inmarsat 5 F4’s solar panels May 28 to a wingspan of 133 feet — more than 40 meters — wider than the wingspan of a Boeing 737 passenger jet, Franci said. Then the satellite’s xenon-ion maneuvering jets will take over to fine-tune its path around Earth, settling in a circular orbit directly over Earth’s equator by mid-August. If the Falcon 9 can boost the craft into a higher-than-expected orbit, several weeks could be shaved off the orbit-raising schedule, according to Franci. “There’s quite some variability (in the targeted orbit), but in the worst case, we’ll still make the nominal 15-year mission that the satellite has been designed for,” Franci said. The satellite will also unfurl its antenna reflectors once stabilized in its final orbit. Inmarsat 5 F4 should be operational around the end of this year, and its first job will likely be to grow Inmarsat’s broadband network load over Europe, the Middle East, North Africa and the Indian subcontinent, Franci said. Rupert Pearce, Inmarsat’s chief executive, said May 4 there is a “strong business case” for locating the new satellite over Europe, but he said Inmarsat has not solidified its plan for Inmarsat 5 F4. Franci said Friday that Inmarsat 5 F4 will carry commercial broadband traffic “right at the start” of its operational life. The major customers for the Global Xpress network — Inmarsat’s fifth-generation fleet — include airlines, which use satellite links for safety and passenger entertainment, the maritime industry, oil and gas platforms, media companies, and the military. Based on the Boeing 702HP satellite bus, Inmarsat 5 F4 joins three nearly identical spacecraft successfully orbited on three Russian Proton rockets from 2013 through 2015 under the auspices of International Launch Services, a U.S.-based, Russian-owned launch services provider. The first three Inmarsat 5-series satellites are parked in geostationary orbit at positions around the globe. The first Global Xpress satellite is positioned to cover Europe, the Middle East and Africa, the second is over the Atlantic Ocean and the Americas, and a third Inmarsat 5 satellite launched in August 2015 provides coverage to the Asia-Pacific and Australia. Each Inmarsat 5-series Global Xpress satellite carries 89 fixed and six steerable spot beams in Ka-band. The company’s earlier satellites broadcast in L-band, but Inmarsat switched to Ka-band for the Global Xpress system, offering improved downlink communications speeds to 50 megabits per second, with up to 5 megabits per second on the uplink side. The jump in throughput with Global Xpress has attracted airlines and maritime operators to Inmarsat. According to Franci, around 1,000 ships already use Global Xpress services. “The system is working steady, even though we’re still in the introductory phase, but we are already seeing that in many areas there is going to be concentration of traffic,” he said. Pearce said May 4 that Global Xpress is now in full commercial service providing passenger broadband connectivity on 80 aircraft operated by Lufthansa, Austrian Airlines and Swiss International Air Lines. The German low-cost carrier Eurowings will start using Global Xpress in a few weeks, he said. Inmarsat also has an agreement to add Global Xpress receivers to aircraft owned by the Malaysian airline AirAsia, and Qatar Airways has announced it intends to install Global Xpress for in-flight wifi on its long-haul planes. Boeing is responsible for selling military-grade Global Xpress Ka-band services to U.S. government and military users. Monday’s launch is Inmarsat’s first mission with SpaceX, but Franci, a former procurement agent for SES, has experience with the launch company. SES was the first major commercial satellite operator to reserve a launch with SpaceX, and the Luxembourg-headquartered firm again took a chance with SpaceX in March, when it put a satellite aboard the first re-flight of a previously-used Falcon 9 rocket. SpaceX and many of its customers, including SES, believe the successful reuse of a Falcon 9 first stage is a harbinger of a new era of spaceflight with lower-cost launches. 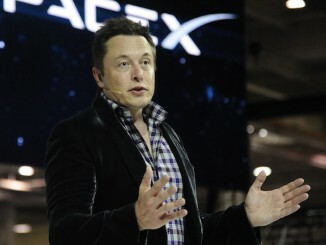 The Falcon 9 set for blastoff Monday is a newly-manufactured vehicle. 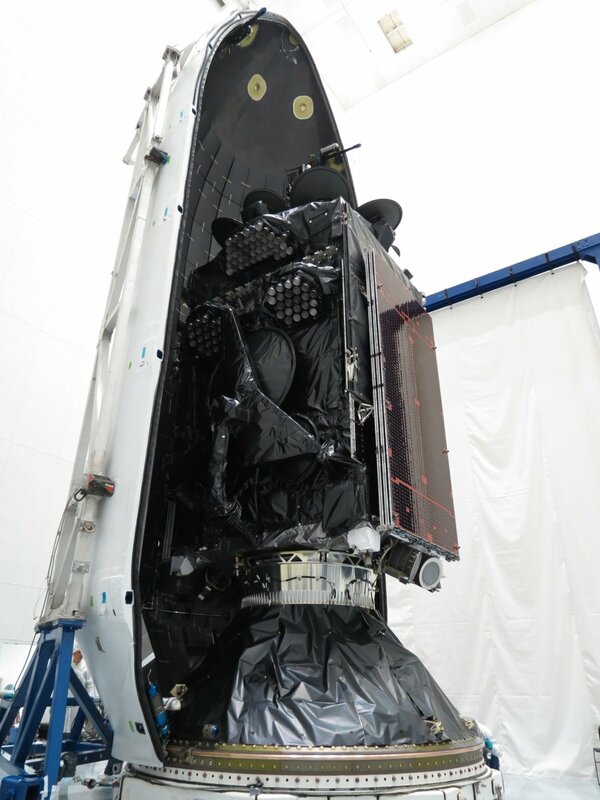 Inmarsat originally booked Inmarsat 5 F4 for a launch on SpaceX’s Falcon Heavy rocket, but delays in the debut of the new commercial mega-booster prompted a switch to the smaller Falcon 9 to avoid a “very significant delay,” Franci said. Inmarsat also moved another satellite off the Falcon Heavy last year, booking it on an Ariane 5 rocket launch from SpaceX rival Arianespace. That spacecraft, owned in partnership by Inmarsat and Greece’s Hellas-Sat, will lift off June 28 from French Guiana. Franci said Inmarsat has contract options to launch more satellites with SpaceX in the future, but no firm payload assignments have been made. “It’s an important launch for me and for Inmarsat,” Franci said of Monday’s mission. “We have always launched a bit less than some of our competitors, so every launch is very, very important.